This article is about the Italian medieval theologian. For other uses, see Bonaventure (disambiguation). Saint Bonaventure (/ˈbɒnəˌvɛntʃər, ˌbɒnəˈvɛn-/; Italian: Bonaventura [ˌbɔnavenˈtuːra]; 1221 – 15 July 1274), born Giovanni di Fidanza, was an Italian medieval Franciscan, scholastic theologian and philosopher. The seventh Minister General of the Order of Friars Minor, he was also Cardinal Bishop of Albano. He was canonised on 14 April 1482 by Pope Sixtus IV and declared a Doctor of the Church in the year 1588 by Pope Sixtus V. He is known as the "Seraphic Doctor" (Latin: Doctor Seraphicus). Many writings believed in the Middle Ages to be his are now collected under the name Pseudo-Bonaventure. He was born at Bagnoregio in Umbria, not far from Viterbo, then part of the Papal States. Almost nothing is known of his childhood, other than the names of his parents, Giovanni di Fidanza and Maria di Ritella. He entered the Franciscan Order in 1243 and studied at the University of Paris, possibly under Alexander of Hales, and certainly under Alexander's successor, John of Rochelle. In 1253 he held the Franciscan chair at Paris. A dispute between seculars and mendicants delayed his reception as Master until 1257, where his degree was taken in company with Thomas Aquinas. Three years earlier his fame had earned him the position of lecturer on The Four Books of Sentences—a book of theology written by Peter Lombard in the twelfth century—and in 1255 he received the degree of master, the medieval equivalent of doctor. After having successfully defended his order against the reproaches of the anti-mendicant party, he was elected Minister General of the Franciscan Order. On 24 November 1265, he was selected for the post of Archbishop of York; however, he was never consecrated and resigned the appointment in October 1266. During his tenure, the General Chapter of Narbonne, held in 1260, promulgated a decree prohibiting the publication of any work out of the order without permission from the higher superiors. This prohibition has induced modern writers to pass severe judgment upon Roger Bacon's superiors being envious of Bacon's abilities. However, the prohibition enjoined on Bacon was a general one, which extended to the whole order. Its promulgation was not directed against him, but rather against Gerard of Borgo San Donnino. Gerard had published in 1254 without permission a heretical work, Introductorius in Evangelium æternum (An Introduction to the Eternal Gospel). Thereupon the General Chapter of Narbonne promulgated the above-mentioned decree, identical with the "constitutio gravis in contrarium" Bacon speaks of. The above-mentioned prohibition was rescinded in Roger's favour unexpectedly in 1266. Bonaventure was instrumental in procuring the election of Pope Gregory X, who rewarded him with the title of Cardinal Bishop of Albano, and insisted on his presence at the great Second Council of Lyon in 1274. There, after his significant contributions led to a union of the Greek and Latin churches, Bonaventure died suddenly and in suspicious circumstances. The 1913 ion of the Catholic Encyclopedia has citations that suggest he was poisoned, but no mention is made of this in the 2003 second ion of the New Catholic Encyclopedia. The only extant relic of the saint is the arm and hand with which he wrote his Commentary on the Sentences, which is now conserved at Bagnoregio, in the parish church of St. Nicholas. Bonaventure's feast day was included in the General Roman Calendar immediately upon his canonisation in 1482. It was at first celebrated on the second Sunday in July, but was moved in 1568 to 14 July, since 15 July, the anniversary of his death, was at that time taken up with the feast of Saint Henry. It remained on that date, with the rank of "double", until 1960, when it was reclassified as a feast of the third class. In 1969 it was classified as an obligatory memorial and assigned to the date of his death, 15 July. Bonaventure was formally canonised in 1484 by the Franciscan Pope Sixtus IV, and ranked along with Thomas Aquinas as the greatest of the Doctors of the Church by another Franciscan, Pope Sixtus V, in 1587. Bonaventure was regarded as one of the greatest philosophers of the Middle Ages. His works, as arranged in the most recent Critical Edition by the Quaracchi Fathers (Collegio S. Bonaventura), consist of a Commentary on the Sentences of Lombard, in four volumes, and eight other volumes, including a Commentary on the Gospel of St Luke and a number of smaller works; the most famous of which are The Mind's Road to God (Itinerarium mentis in Deum), an outline of his theology or Brief Reading (Breviloquium), Reduction of the Arts to Theology (De reductione artium ad theologiam), and Soliloquy on the Four Spiritual Exercises (Soliloquium de quatuor mentalibus exercitiis), The Tree of Life (Lignum vitae), and The Triple Way (De Triplici via), the latter three written for the spiritual direction of his fellow Franciscans. For St. Isabelle of France, the sister of King St. Louis IX of France, and her monastery of Poor Clares at Longchamps, St. Bonaventure wrote the treatise, Concerning the Perfection of Life. The Commentary on the Sentences, written at the command of his superiors when he was twenty-seven, is Bonaventure's major work and most of his other theological and philosophical writings are in some way dependent on it. However, some of Bonaventure's later works, such as the Lectures on the Six Days of Creation, show substantial developments beyond the Sentences. Much of St. Bonaventure’s philosophical thought shows a considerable influence by Augustine of Hippo. So much so that De Wulf considers him the best medieval representative of Augustinianism. St. Bonaventure adds Aristotelian principles to the Augustinian doctrine, especially in connection with the illumination of the intellect and the composition of human beings and other living creatures in terms of matter and form. St. Augustine, who had introduced into the west many of the doctrines that would define scholastic philosophy, was an incredibly important source of Bonaventure's Platonism. The mystic Dionysius the Areopagite was another notable influence. In philosophy Bonaventure presents a marked contrast to his contemporaries, Roger Bacon, Albert the Great, and Thomas Aquinas. While these may be taken as representing, respectively, physical science yet in its infancy, and Aristotelian scholasticism in its most perfect form, he presents the mystical and Platonizing mode of speculation that had already, to some extent, found expression in Hugo and Richard of St. Victor, Alexander of Hales, and in Bernard of Clairvaux. To him, the purely intellectual element, though never absent, is of inferior interest when compared with the living power of the affections or the heart. St. Bonaventure receives the envoys of the Byzantine Emperor at the Second Council of Lyon. Like Thomas Aquinas, with whom he shared numerous profound agreements in matters theological and philosophical, he combated the Aristotelian notion of the eternity of the world vigorously (though he disagreed with Aquinas about the abstract possibility of an eternal universe). Bonaventure accepts the neo-Platonic doctrine that "forms" do not exist as subsistent entities, but as ideals or archetypes in the mind of God, according to which actual things were formed; and this conception has no slight influence upon his philosophy. Due to this philosophy, physicist and philosopher Max Bernhard Weinstein contended that Bonaventure showed strong pandeistic inclinations. Like all the great scholastic doctors, Bonaventura starts with the discussion of the relations between reason and faith. All the sciences are but the handmaids of theology; reason can discover some of the moral truths that form the groundwork of the Christian system, but others it can only receive and apprehend through divine illumination. To obtain this illumination, the soul must employ the proper means, which are prayer, the exercise of the virtues, whereby it is rendered fit to accept the divine light, and mation that may rise even to ecstatic union with God. The supreme end of life is such union, union in contemplation or intellect and in intense absorbing love; but it cannot be entirely reached in this life, and remains as a hope for the future. Like Aquinas and other notable thirteenth-century philosophers and theologians, Bonaventure believed that it is possible to prove the existence of God and the immortality of the soul. He offers several arguments for the existence of God, including versions of St. Anselm's ontological argument and Augustine's argument from eternal truths. His main argument for the immortality of the soul appeals to humans' natural desire for perfect happiness, and is reminiscent of C. S. Lewis's argument from desire. Contrary to Aquinas, Bonaventure did not believe that philosophy was an autonomous disciple that could be pursued successfully independently of theology. Any philosopher is bound to fall into serious error, he believed, who lacks the light of faith. 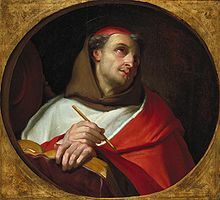 Bonaventure, however, is not only a mative thinker, whose works may form good manuals of devotion; he is a dogmatic theologian of high rank, and on all the disputed questions of scholastic thought, such as universals, matter, seminal reasons, the principle of individuation, or the intellectus agens, he gives weighty and well-reasoned decisions. He agrees with Saint Albert the Great in regarding theology as a practical science; its truths, according to his view, are peculiarly adapted to influence the affections. He discusses very carefully the nature and meaning of the divine attributes; considers universals to be the ideal forms pre-existing in the divine mind according to which things were shaped; holds matter to be pure potentiality that receives individual being and determinateness from the formative power of God, acting according to the ideas; and finally maintains that the agent intellect has no separate existence. On these and on many other points of scholastic philosophy the "Seraphic Doctor" exhibits a combination of subtlety and moderation, which makes his works particularly valuable. St. Bonaventure Monastery, a complex of religious buildings, built for the Order of Friars Minor Capuchin, located in Detroit, Michigan. Venerable Father Solanus Casey served here as the monastery porter from 1924 to 1946, meeting visitors at the friary door. The site is a popular pilgrimage site for Metro Detroit Catholics. St. Bonaventure Church, in Paterson, New Jersey. The Sunday sermons of St. Bonaventure, ed and translated by Timothy J. Johnson, vol. 12, 2008. Disputed questions on evangelical perfection, ed and translated by Thomas Reist and Robert J. Karris, vol. 13, 2008. The Life of Christ translated and ed by William Henry Hutchings, 1881. ^ Herbermann, Charles, ed. (1913). "St. Bonaventure" . Catholic Encyclopedia. New York: Robert Appleton Company. ^ Hammond, Jay M. (2003). "Bonaventure, St.". In Marthaler, Bernard L. (ed.). New Catholic Encyclopedia. Volume 2 (2nd. ed.). Detroit: Thomson/Gale in association with the Catholic University of America. p. 479. ISBN 0-7876-4006-9. ^ a b c d e f g One or more of the preceding sentences incorporates text from a publication now in the public domain: Chisholm, Hugh, ed. (1911). "Bonaventura, Saint" . Encyclopædia Britannica. 4 (11th ed.). Cambridge University Press. pp. 197–198. ^ Witzel, Theophilus (1912). "Roger Bacon". The Catholic Encyclopedia. 13. New York: Robert Appleton Company. Retrieved 12 February 2014. ^ Laurence Costelloe (1911). Saint Bonaventure: The Seraphic Doctor, Minister-general of the Franciscan Order, Cardinal Bishop of Albano. Longmans, Green & Company. ^ a b c Robinson, Paschal (1907). "St. Bonaventure". The Catholic Encyclopedia. 2. New York: Robert Appleton Company. Retrieved 5 January 2013. ^ Schlosser, Marianne (2013). "Bonaventure: Life and Works". In Hammond, Jay M.; Hellmann, J. A. Wayne; Goff, Jared (eds.). A Companion to Bonaventure. Brill's Companions to the Christian Tradition. Boston: Brill. p. 12. n.7. ISBN 978-90-04-26072-6. This treatise has always been recognized as indubitably authentic. A few years ago, Dieter Hattrup voiced his doubts: 'Bonaventura zwischen Mystik und Mystifikation. Wer ist der Autor von De reductione?' Theologie und Glaube 87 (1997): 541–562. However, the recent research of Joshua Benson indicates the text's authenticity: 'Identifying the Literary Genre of the De reductione artium ad theologiam: Bonaventure's Inaugural Lecture at Paris', Franciscan Studies 67 (2009): 149–178. ^ Hindsley, Leonard P. (March 1990). "Reviewed Work: De septem itinerabus aeternitatis. Mystik in Geschichte und Gegenwart, Abteilung I, Christliche Mystik Band 1 & 2 by Rudolf von Biberach, ed and translated by Margot Schmidt". Mystics Quarterly. Penn State University Press. 16 (1): 48–50. JSTOR 20716971. ^ White, J. (2011). "St. Bonaventure and the problem of doctrinal development". American Catholic Philosophical Quarterly. pp. 177–202. ^ Brother John Raymond, "The Theory of Illumination in St. Bonaventure"
Hammond, Jay M. (2003). "Bonaventure, St.". In Marthaler, Bernard L. (ed.). New Catholic Encyclopedia. Volume 2 (2nd. ed.). Detroit: Thomson/Gale in association with the Catholic University of America. pp. 479–493. ISBN 0-7876-4006-9. LaNave, Gregory F. "Bonaventure", in Paul L. Gavrilyuk and Sarah Coakley (eds. ), The Spiritual Senses: Perceiving God in Western Christianity, Cambridge: Cambridge, University of Cambridge, 2011, 159–173. Tavard, George Henry. From Bonaventure to the Reformers, Milwaukee: Marquette University Press, 2005 (Marquette Studies in Theology). ISBN 0-87462-695-1 ISBN 9780874626957. Noone, Tim; Houser, R.E. "Saint Bonaventure". In Zalta, Edward N. (ed.). Stanford Encyclopedia of Philosophy. St Bonaventure from the Franciscan Archive. S Bonaventura: Opera Omnia Peltiero Edente (Latin original texts).